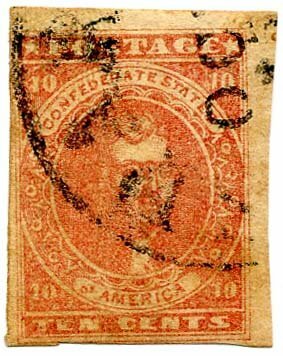 CSA 5, 10¢ rose, 4 huge margins all around, tied on piece by neat RICHMOND / Va. cds, Extremely Fine, 2014 SCV $550. 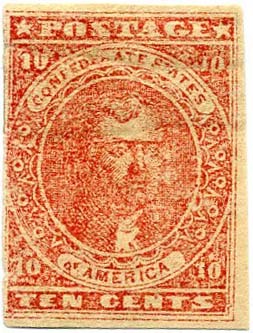 CSA 5, 10¢ rose variety, position 11, circular flaw in upper left star, used with Mississippi cds on small piece, SCV $675. $450. 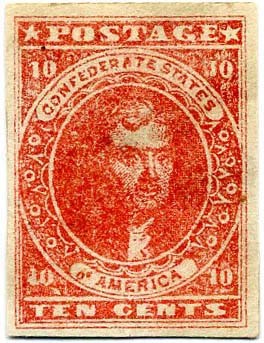 CSA 5, 10¢ rose bottom imprint single used with Richmond, Va. cds, defective and rebacked but stellar appearing example. Quite scarce with imprint. $900. 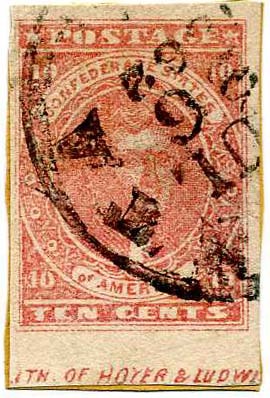 CSA 5, 10¢ pale rose, unused, with gigantic margins all around, regummed and rebacked over tiny faults but quite the looker. 2019 SCV $2,400. $350. CSA 5, 10¢ rose, used with bold neat [S]AVANNA[H / Ga.] // JUL / 24 cds, 4 huge margins, tiniest pinhole thin, Very pretty. $550. 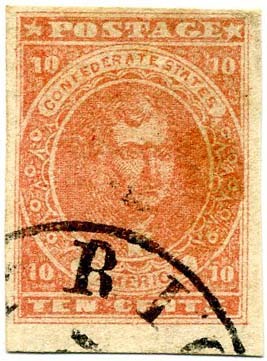 CSA 5, 10¢ rose, large 4-margin stamp used with Tuscaloosa [AL] cds, pressed vertical crease, $300. 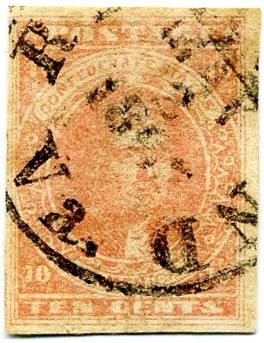 CSA Catalog 5-i1, 10¢ rose, position 45, bottom sheet margin with "(L)ITH. 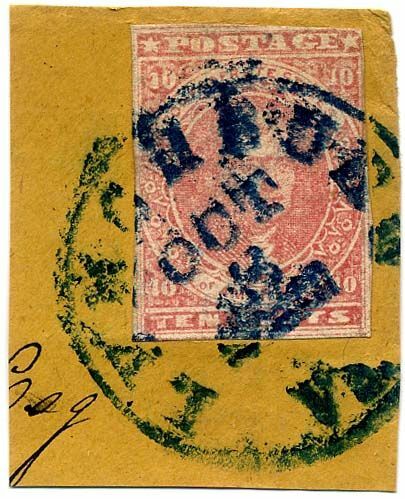 OF HOYER & LUDWI(G)" portion of imprint, also showing white arrow variety, ATLANTA Ga. circular datestamp, affixed to piece which helps mask a margin nick at left and deep thins, Extremely Fine appearance, a scarce example of the 10¢ Rose with part imprint, Ex Hall, CCV $1,750. $950. 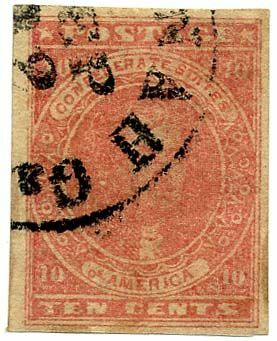 CSA 5, 10¢ pale rose, used with bold Chapel Hill [NC] attributed grid cancel, edge thinning from separation in margins only, crease at lower left, $325. 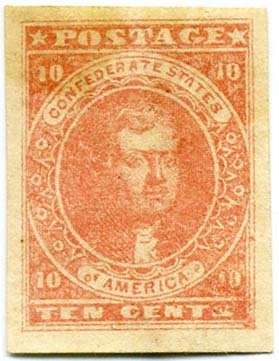 CSA 5, 10¢ rose used with unidentified postmark, scissors cut in bottom margin, slight toning, $250. 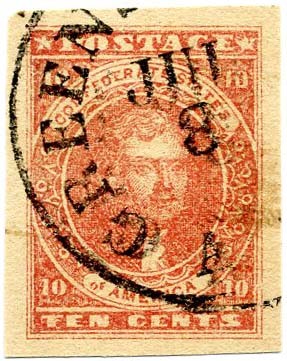 CSA 5, 10¢ rose, large margins all around, tied on small piece of all-over semi-official cover of the Virginia Executive Department by RICHMOND / Va. // JUL / 30 / 1862 cds, Choice! Ex Powell. $900. 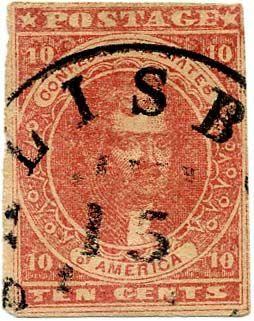 CSA 5, 10¢ rose, rich color, fresh, ample to large margins, used with SAVANNAH Ga // SEP / 22 cds, light vertical bend otherwise Very Fine $450. 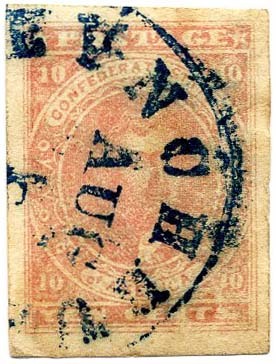 CSA 5, 10¢ rose, used with beautiful bold blue LYNCHBURG / Va. // OCT / 8 cds on small piece, Fine, Ex Powell, $525. 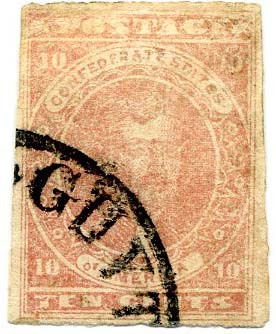 CSA 5, 10¢ rose, used with crisply struck partial cancel of SALISBURY [NC] cds, gorgeous bright rose color, Fine, Ex Powell $425. 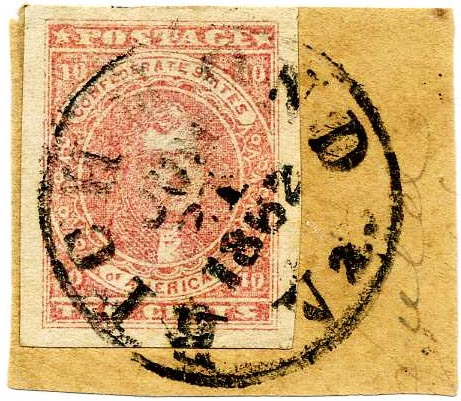 CSA 5-v5, 10¢ rose, listed SCRATCHED STONE VARIETY, position 40 right sheet margin single showing line through "POST" of "POSTAGE" at top, neat 1862 Chester C.H., S.C. town cancel, margins clear to mostly large, strong bright color, Very Fine; SCV $925, with 1990 Brian Green certificate. $900. 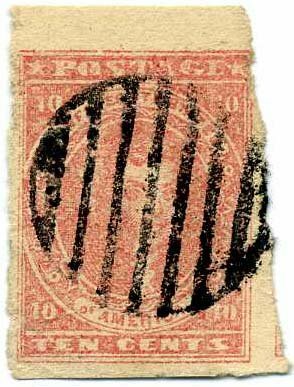 CSA 5, 10¢ rose, used with grid cancel, small pen stroke (?) erosion mark at top, tiny tear in right margin just touching frame. $275. 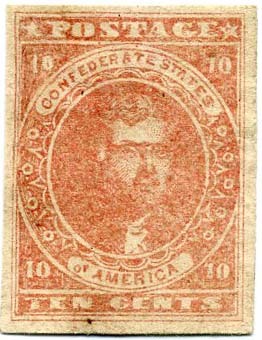 CSA 5, 10¢ rose used with cds of GUYTON / GA, light corner crease upper left, bit soiled. $250. 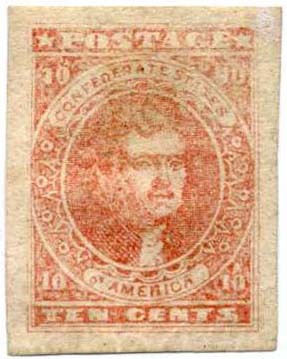 CSA 5, 10¢ rose with 60% of original gum, heavily hinged, fresh, 2 horizontal creases, Fine appearance, SCV $2,400. $1,000. 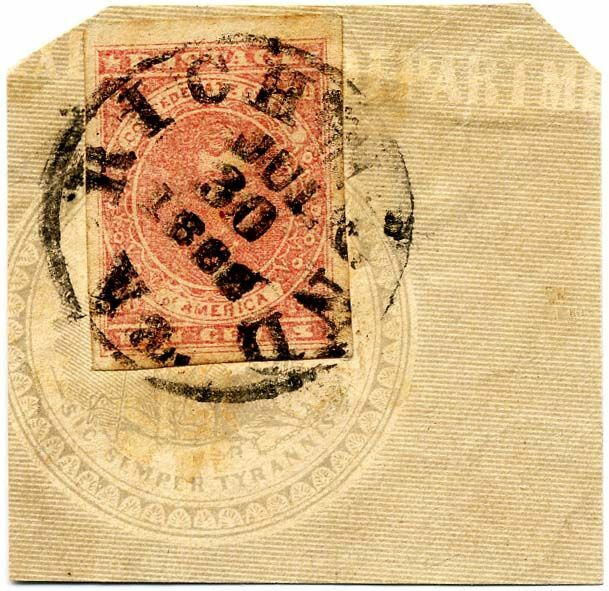 CSA 5, 10¢ rose, used with FACE FREE Richmond postmark, light stain at right and tiny edge tear in left margin, Very Fine appearance. $400. 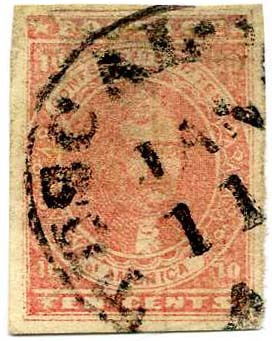 CSA 5, 10¢ rose SPERATI FORGERY, gummed, Extremely Fine, Almost as collectable as the real thing! 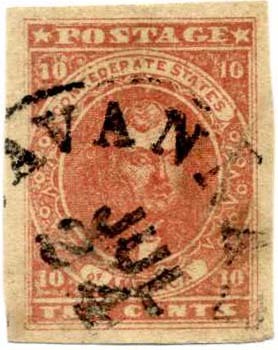 2010 APS certificate, Ex Katz. $500. 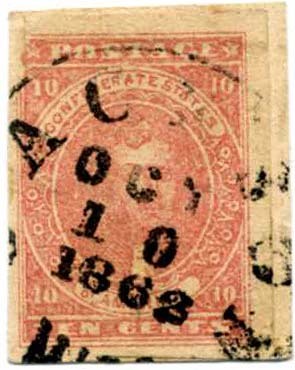 CSA 5, 10¢ rose, 4 nice margins, used with RICHMOND / Va. // JUN / 30 / 1862 – Powell type 3b CDS with Broken “N” in JUN, used only in the month of June 1862, making this the LAST DAY OF THE 5¢ RATE, light crease, Nice! 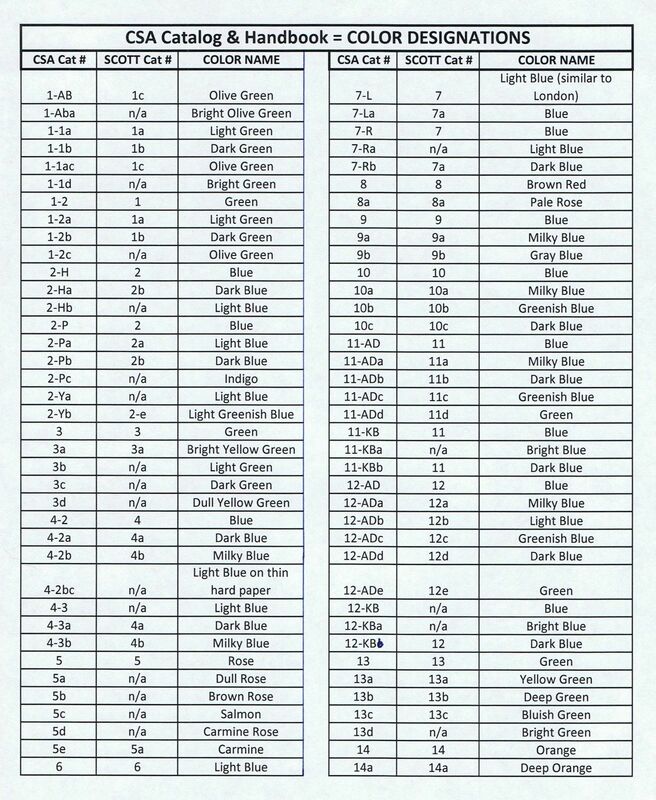 SCV $450+ $450. 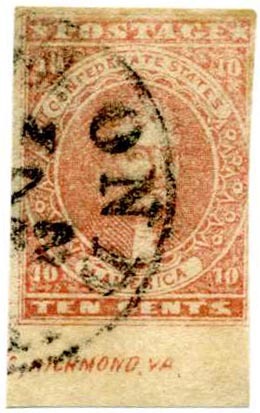 CSA 5, 10¢ rose, JUMBO margins all around, used with GREENSBOROUGH / ALA // JUL / 8 cds, faintest trace of pen slash at left, Superb Showstopper. $1,800. CSA 5, 10¢ rose, unused, no gum, expertly repaired (filled thin at center, UL corner replaced), fresh and Very Fine appearing. SCV $2,400. $250. 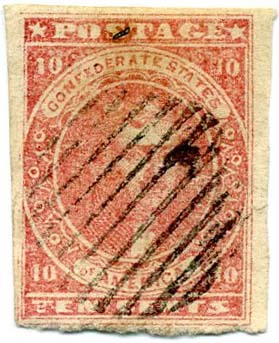 CSA 5, 10¢ dull rose, used with R[ICHMO]ND / Va. // MAY / 2 / 1862 cds, 4 ample to large margins, Very Fine. $500. 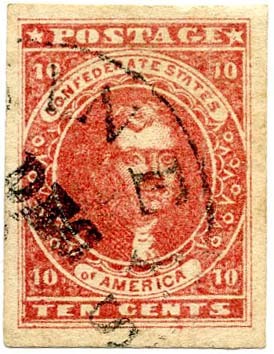 CSA 5, 10¢ light rose, unused (no gum), faint soiling at top left, still Extremely Fine, 2019 SCV $2,400. $1,800. 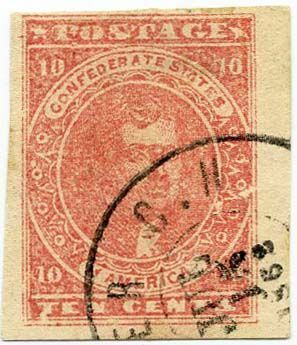 CSA 5a (CSA Catalog #), 10¢ dull rose, 4 large even margins, used with nicely struck blue LYNCHBURG / Va. // AUG cds, tiny thin, CCV $715, SCV $500. $300. 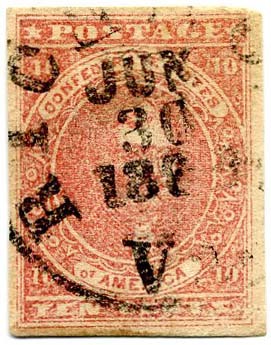 CSA 5, 10¢ carmine rose, huge even margins, used with light postmark, beautiful bright color, vertical crease just visible when drying, Extremely Fine appearance. SCV $850. $700.